This page is basically an extension to the "help" page, but also an acknowledgement that some teams will always remain as unknowns or anomalies. Subbuteo production was sadly not meticulously catalogued, and no easy answers exist for un-catalogued teams. The idea of this page was simply to illustrate any teams that did not fit in nicely anywhere else. Every collector will come across figures that he cannot identify. It is one of the most frequently asked questions to the website. The hand-painted teams of the 1960s-70s are the hardest to include here, because so many were repainted in the 1970s. In addition, the value that collectors have placed on the more unusual sides today means that modern re-painted teams are a sad fact of life on ebay and in collecting circles. The fact that unusual sides command a high premium, makes everyone hope that the weird team they have picked up is some fabulous rarity. However, Subbuteo was mass produced, and there probably aren't any unique sides. The more unique a side, the more likely it is to have originated in somebody's bedroom. 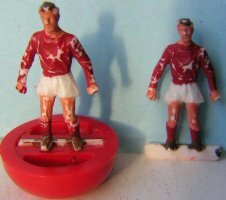 In addition, Subbuteo used a large number of outworkers to paint their teams. If an outworker painted a unique team for a family member is that an official team? The answer is probably "no", but what really is the difference? How about if they painted a whole batch slightly wrongly (or even more accurately to the team's colours of the day). Did quality control reject the teams, or did they cut their loses and box them up? 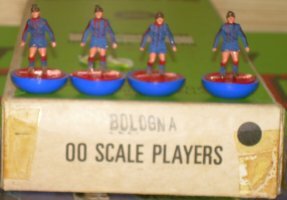 The real value in Subbuteo is on catalogued teams in numbered boxes. This team was photographed at the Subbuteo Exhibition in Tunbridge Wells Museum, in August 2005. It had come from a little tin full of very early card teams (the kind of thing you really want to find at a boot sale!!). An identical team is shown in Subbuteo book "Flick to Kick" (page 34), alongside a flat Hamilton with white shorts (so not matching the early description of reference 20). The team that wore this kit in the late 1940s was Walsall, who appear in the early catalogues (out of alphabetical order) on the standard ref 1. Did they stop wearing the kit before it made the catalogues? As mentioned above, most weird heavyweights are not the genuine article. Look closely, and you might find a colour that doesn't match the rest of the side, or a glimpse of the original colour beneath. Always compare to other Subbuteo figures you own. Nevertheless, there are times when you pick up a cheap box of players locally, and find a player who looks absolutely spot on, but still doesn't match the catalogues. These teams rarely turn up whole and in a box. That would be too easy! I would suspect that they have curiosity value only, as there doesn't seem any way to certify them as the real deal. (picture 1) I own two of these players. I assume they are Barcelona, and might be a ref 19 variation. However, ref 19 is red stripes painted onto blue, and not blue painted onto red. The socks are black with red and blue trim. The colours all match, the tones look right and nothing looks to have been added later. SOLVED: Although the blue looked fine, closer inspection reveals that it is painted over the black. A clear suggestion of black under the shorts indicates that this was originally a ref 14. So NOT an original on this occasion. (Picture 2) I own one of these. He came in a box of players that included about half of a 1970s shop chart of h/ws (1-105 plus world cup sides when complete). There was no ref 5, but that doesn't mean this was it. A similar team was sold in the C100s series in Italy as Napoli. Does this solo English one suggest that the team also appeared here? Another (good) suggestion is that this is a late 1960s named box Manchester City (like the Derby County shown below). (Picture 3) Heavyweight collector Mark McKinley owns this one. It's an all pale blue side on a flesh figure. The base colour suggests that this was not a ref 43 with the trim forgotten. Mark's team came from a Munich set, and he suggests England 3rd as an possible team. (the powder blue kit produced for the 1970 World Cup). He thinks the team has also been seen in a ref 5 box, which suggests a link to the Man City change to light blue shorts that occurred in the mid 1970s (City moved to ref 191 in 1977). SOLVED: This is another late 1960s/early 1970s named box team. Seen on ebay in an England 2nd box of the correct vintage, with the tell-tale typed name tag. A further Man City variation has been raised in collecting circles a couple of times. This is the addition of claret sock tops in the 1960s. Mark Adolph's Subbuteo book has this version on the front cover, although, of course, this sock trim would have been an easy addition for any bedroom painter of the time to have done. (Picture 4) This team was sent in by e-mail. It was in a Derby County named box from the late 1960s. I couldn't be sure that all the trim was genuine. However, looking through my old pictures recently found the same kit on a statuette, sold on ebay back in September 2000. Anyone else own this one? December 2006: I've picked up this team's twin locally, and so I am obviously more convinced than ever that it is genuine side. Mine has a reverse base to the one shown, is much more tatty, only has nine players and no named box. However, the look of the figure is identical. I'm obviously chuffed! We seem to be doing well solving the unknown teams shown above, so here are a few more to puzzle over. This is another oddity. It is essentially reference 95 with blue shorts. This seems like a deliberate act though, as the player is painted onto flesh coloured plastic. If it was supposed to have white shorts, then it would be likely to be on white plastic. The red looks a bit bright to my eye, but photos can be deceptive. A named box is always a help! Does anyone else own this one? Thanks to Jon Rosten for sending this one in. This is a bit of fun. If there is one unknown team that I have been asked about by Italian collectors more than any other, it is the green team shown above. It seems to turn up in Italian collecting circles every couple of years, and I did wonder if it was the same team being passed around. However, as you can see from the above photos, the team has been sighted in reversed bases of green and black. The blue team (usually regarded as an alternate Sampdoria) has turned up in the same circles. Note though, that on this team, the stripes are not in the usual order for Sampdoria (ref 94). Now when pictures of weird teams that get sent to me, I am usually cautious in reply. "It's probably repainted by a previous owner" is the likely explanation. I've outlined why at the top of this page. 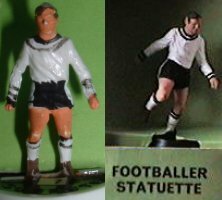 With these two teams, the markings are not in a familiar Subbuteo style, and as there is no white in either kit, I would expect them to be painted on flesh coloured plastic. With any teams though, the more times they turn up, the more they need to be reconsidered. Why is this a French-Italian puzzle? Well, Italian collector Fabrizio Frazzoni recently got back in touch to say that a friend (Dario Pattarini) had found both of these kits on a French football website. 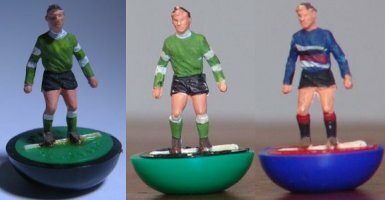 The green team was the away kit of Nancy in 1971-72, and note that the arm bands match ref 141, which was Subbuteo's Nancy kit. Meanwhile, the blue team was the away kit of Nice from the same season. Both kits were originally designed by inventive French manufacturer Le Coq Sportif. Sadly, the teams do not seem to appear in any French or Italian catalogues that I am aware of. However, at least we now have a date and country to work with. (left). This is a nice simple R5 Wales.... except for the figure type. The moulded base figure with the winged shorts was obviously produced on a bar in small quantities. This is another unusual figure that has been sneaked into "Flick to Kick", to amuse serious collectors (it's on the back cover in the ref 11 QPR strip). (middle) it's that winged shorts figure again.... this time in an interchangeable goalkeepers set from the mid 1970s. Where will he turn up next?? December 2010: I've actually managed to pick up this player's twin in an interchangeable goalkeeper set locally, so it is more than just a one-off. (right) It's a ref 50 Brazil, but it has been painted onto the rugby figure. At least a couple of Brazil teams like this exist within the collecting community. Does anyone have any other sides beyond refs one and two ?? Just the one at present. Six players in a collection of loose players owned by Worthing Five-Star hero Brian Barnes (until I acquired it). It is probably ref 270 Los Angeles Aztecs, but that didn't have the claret trim. Bradford were also on this number in 1979, and they probably did have claret trim in real life. This extra trim does not appear to have been added by a 1970s Bradford fan who wanted a more accurate kit. But I concede that it might have. Anyone own a similar set? The great thing about machine printed lightweights is that they can't be faked easily. They were also obviously produced in large batches. So one-off sides are not an option. Most odd machine prints appear loose, or in box sets. In all likelihood, some of these are prints that came out wrong, but that were recycled into sets rather than be thrown away. (left). This looks like a West Germany. But tying it down to a number is harder. 247? maybe, but why the cuffs? 156? Nope. It matches 154 in the 1979 catalogue, but we already have two versions of that number. And why the badge? Someone must have this team boxed. Can anyone help out here? (middle) Quite a common one. It's basically a ref 364 Chelsea, but somebody forgot the blue shorts. Always seems to appear loose, and never in a 364 box. Was it sold as such? (right) Another reasonably common one. This looks like the 1993 version of 608 Motherwell, but in the colours of 605 Clydebank.